I've been wishing really, really hard for a boat. 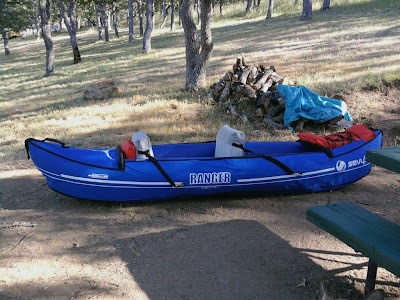 Just a little boat to paddle around the lake in. No motor, no noise, no skis, no fishing gear. Just a humble, frill-free, small craft to drift around in. Living at a lake and not having a boat is like living next door to someone who throws great parties, and never being invited. You can hear the music and smell the food and peek through the fence and see all the fun, but it's just not the same as being there. Well, I finally realized that all the wishing in the world was not going to get the attention of the Boat Fairy, so a couple of days ago, I said to Rick, let's go buy a boat. It worked like magic! Now we're at the party too! I had a most amazing little visitor today. 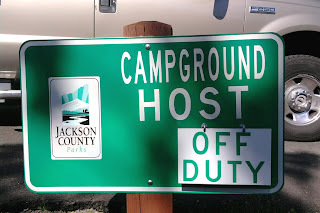 Walking back from my after-lunch campground rounds, I noticed a flurry of wings and loud squawking under our awning. A couple of deviant looking scrub jays split the scene when they saw me, landing in the nearest oak tree, but kept on taunting another bird that seemed to be taking refuge on the back of my camp chair. 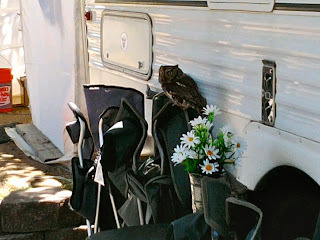 When I got a little closer, I realized it was an owl. A baby owl, no bigger than my hand. I'm taking my camera, MacBook, and Mifi so you can follow along. See you at the beach! Campsite #11 seems to have a magnetic pull, attracting families that remind me of Cousin Eddie's, in National Lampoon's Christmas Vacation. The folks in my story were settled into the tent site with their "tenement on wheels" the day I walked by, making my friendly camp host rounds. The pot-bellied dad and granddad sat in folding chairs, looking at the ground, barely glancing up as I approached. A pot-bellied dachshund and a yippy little terrier mix sniffed around for food, and two tiny puppies that looked just like the adult dogs scampered over to greet me. Do you have something of a visual on these folks? Well hello again. It's nice to be back. I feel a little silly, but I'm used to feeling silly, so that's no big deal. I've had a month or so to catch my breath, and to realize that I have some sort of need to write. Wanna laugh? As soon as I made that grand announcement about ending the blog, my mind went directly to wanting to blog about how it felt to stop blogging. Silly indeed.